Looking for pendant lighting ideas? Love Regina Andrews Chandeliers? 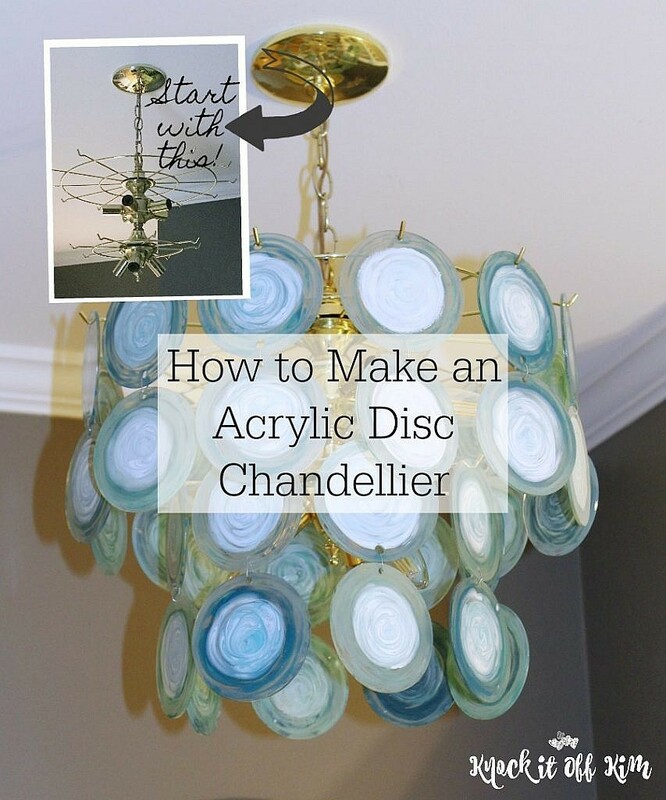 Give a thrift store chandelier new life and a high-end, mid-century look, with a cheap, easy, DIY project using acrylic discs and nail polish! 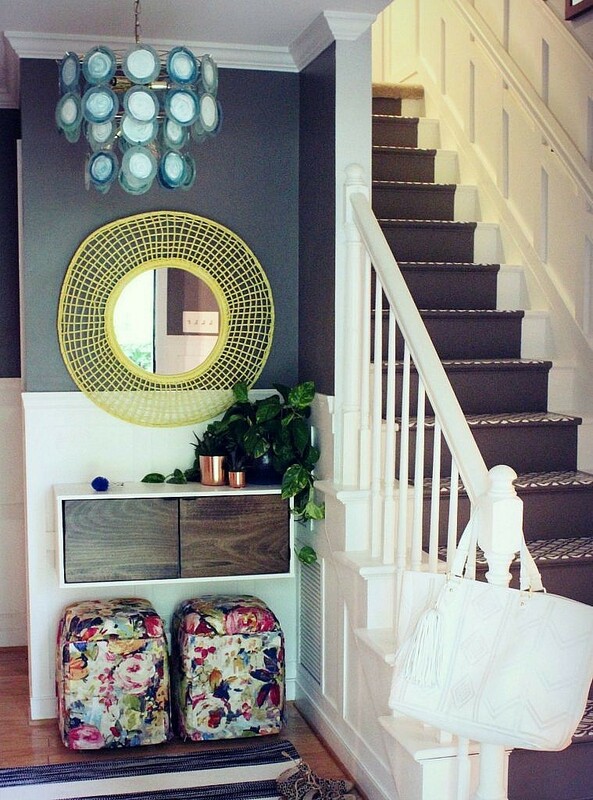 During our recent Foyer make-over, I went on a mad hunt for eye-catching pendant lighting ideas. I wanted something with color and with a definite presence. 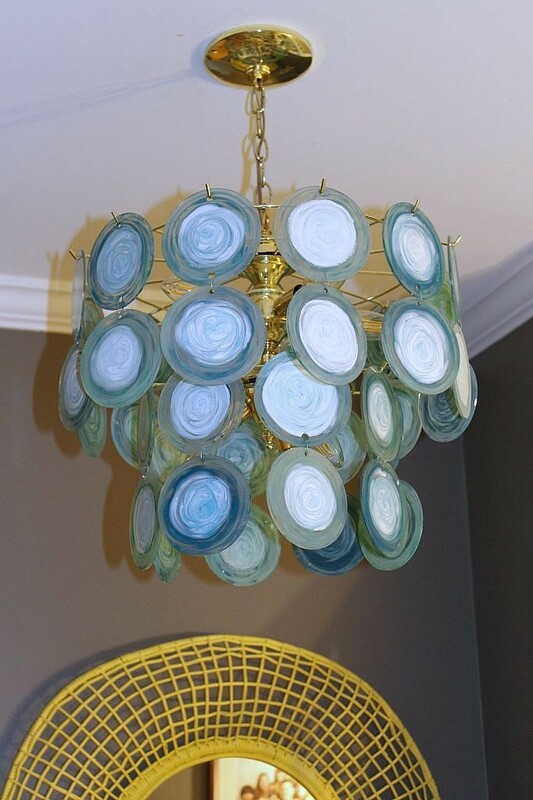 After a bit of research, I found a gorgeous chandelier from Regina Andrews in tones of blue and seafoam and some beautiful examples of vintage Murano glass chandeliers made in a Vistiso style. Vintage Vistosi pieces from the 1960s and 70s go for anywhere between $700 and $4000 at auction. Incredible to look at, but far out of my price range. 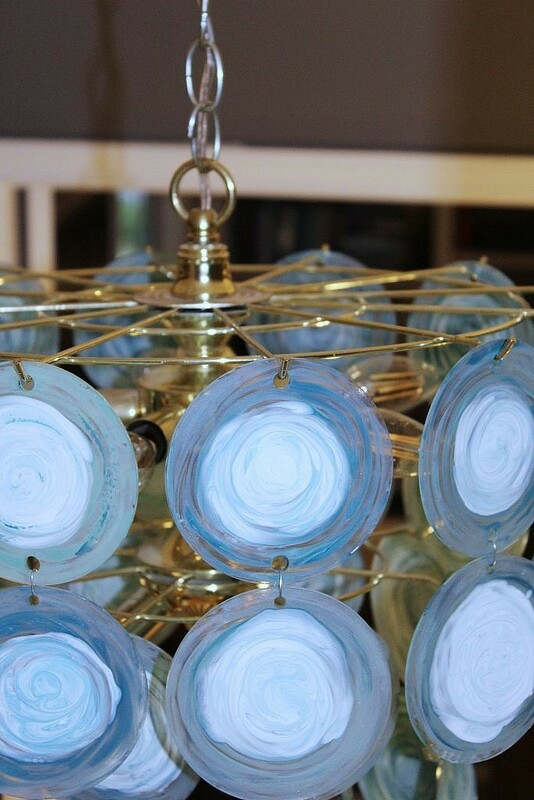 Believe it or not, these works of art are also super simple (and cheap) to hack, using an eye-sore brass chandelier found in every thrift store, nail polish and acrylic discs! A little bit of trivia about Vistosi: Guglielmo Vistosi founded the Murano, Italy glass and lighting manufacturer in 1945. With a history in glass making dating back to the 16th century, the Vistosi family has passed its secrets for beautiful glass making from generation to generation and has established its place in the Venitian artistic glass world – a brand known to combine exquisite style and classic design. Lucky us, Vistosi continues to give the world beautiful glass and lighting creations to this day. *This post contains affiliate links for your convenience. Please see my disclaimer for more info and thanks for supporting KnockitOffKim! 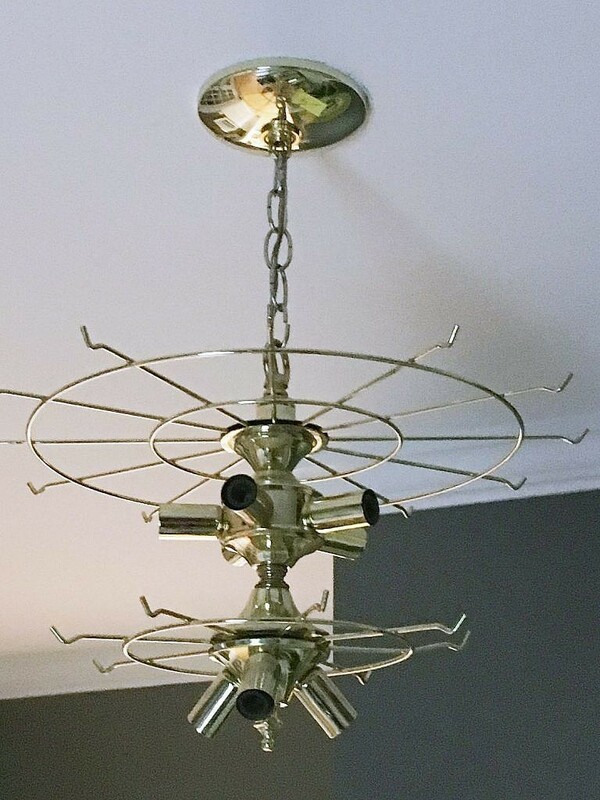 So, after that fun tidbit of info, how did I DIY this high-end, mid-century-looking lighting masterpiece? Easy. Peasy. An 80s Glass Panel Chandelier frame with arms – you can find this at any thrift store for around $5! Install your light frame. Be safe – if you aren’t familiar with electrical work, or even aren’t completely comfortable, hire a professional to help you. Install light bulbs – be sure to use new low-heat light bulbs! I used these which are bright, energy-efficient, and unlike some low-energy bulbs, have no delay when lighting. Remove the paper backing from the discs. Carefully dribble a thin line of the dark and light colored nail polishes in a circular pattern starting from the outside edge of the disc toward the center. Working from the outside in toward the center, using the nail polish brush, firmly move the polish around in a wide swirl pattern. Carefully dribble a thin line of white nail polish in a circular pattern starting from the center working outward to the outside edge, stopping 2″ from the edge. Working from the inside out, using the nail polish brush, firmly swirl the white polish in a wide swirl pattern. Allow the discs to dry. Connect a double-hole disc to a single hole disc using the wire connectors. Hang one double-disc strand from each frame arm. 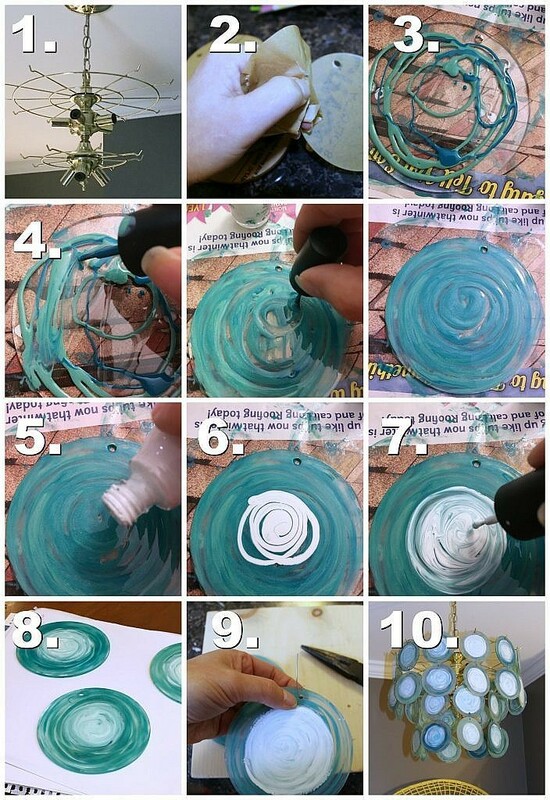 Stand back in amazement at your DIY talents! Prefer a visual? Here’s a picture tutorial. So it’s even easier for you, I’ve made a downloadable copy available to you and my subscribers that you can access here. My DIY high-end look, mid-century-style pendant lighting is the first thing people see when they enter our home; A perfect focal point that always garners compliments and questions. I’m so happy with the results and am even more thrilled with how much it cost to DIY! So, what do you think? Is it perfect for your home, too? If you think it is, please, let me know how your project goes and if you have any questions! Like this project? Looking for more budget-friendly upcycles and decor? Enter your email address to subscribe for non-stop Knock it Off Kim fun! What an amazing idea. Your eye-catching lighting ideas make me crazy. I wanna make it. Thanks for great idea. Kim, this is incredible! The discs remind me so much of glass, or even agate slices. So cool!